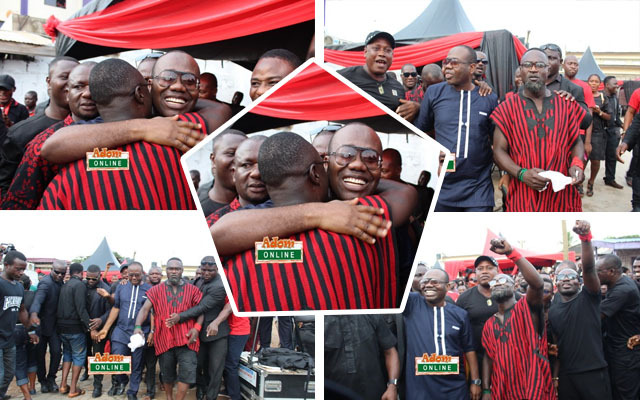 Two rivals in the sports fraternity were united at the one week celebration of ace broadcaster, Kwadwo Asare Baffuor Acheampong also known as KABA. President of the Ghana Football Association (GFA), Kwesi Nyantakyi and his avowed critic, Patrick Osei Agyemang popularly known as Countryman Songo embraced and danced to demonstrate their unity to the excitement of the crowd at the one week celebration of the late presenter. This comes after President of the GFA launched a $2m libel suit against Multimedia Broadcasting Limited (MBL) for allegedly being described on its platforms as the ‘head of a mafia’. Nyantakyi sued two of its journalists, Patrick Osei Agyeman and Kofi Asare Brako also known as Abatay (who now works with another media company) for consistently defaming his name and character for years on the Multimedia Group owned radio station Asempa Fm. Nyantakyi, an executive committee member of the Confederation of African Football, claims Asempa FM – a local-language FM station owned by MBL – tarnished his image in a series of broadcasts involving both journalists. But the neutrality and professionalism of KABA though no more was able to unite these two who had vowed never to see eye-to-eye. Mr. Nyantakyi after expressing his condolence to the late KABA’s family and the Multimedia Group also donated GH₵2000 and 20 boxes of bottled water to support the funeral of the late Asempa FM presenter. The families of KABA, and those of Valentina are here with a unity of purpose- to give a befitting one week to the departed soul of the once bubbly broadcaster.